Update 12.11.2013: Das Bündnis TTIP-Unfairhandelbar der deutschen TTIP-KritikerInnen meldet sich heute mit einer Pressemitteilung zu Wort. 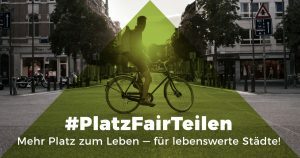 Gemeinsam mit anderen Organisationen fordert auch PowerShift den Abbruch der geheimen Verhandlungen und eine demokratische, zukunftsfähige Handelspolitik. Meldung vom 11.11.2013: Fast 100 Organisationen aus den USA und Europa haben angesichts der heute in Brüssel anlaufenden 2. Verhandlungsrunde zum TTIP-Abkommen zwischen der EU und den USA noch einmal ihre Kritik an dem intransparenten Verhandlungsprozeß deutlich gemacht. In einem Brief an Präsident Obama, EU-Kommissionspräsident Barroso und Ratspräsident van Rompuy äußern sie ihre Kritikpunkte und Sorgen zum drohenden Vertrag. Weitere Informationen und Aktivitäten folgen im Laufe der Woche! The United States and the European Union are set to begin negotiations of a “trade” and investment agreement, a proposed Transatlantic Trade and Investment Partnership (TTIP), also referred to as a Transatlantic Free Trade Agreement (TAFTA). 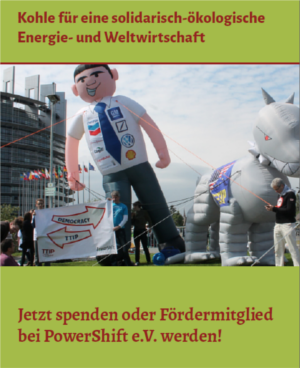 We the undersigned organizations from Europe and the United States wish to register our early concern based on the information about the coming negotiations and state our opposition to the use of behind-closed-door trade negotiations to change and lower public interest measures for the sake of commercial interests. As both parties have noted, because tariffs in the United States and European Union are already low, the proposed agreement would focus in particular on „regulatory issues and non-tariff trade barriers.“ We are concerned that the process leading to the launch of TAFTA negotiations has been dominated by transatlantic business interests, which appear intent on undermining the strongest public interest safeguards on either side of the Atlantic with which their products and operations must now conform. Their agenda is to use these negotiations as a means to pursue deregulation efforts that have been unsuccessful to date. Industry representatives, organized since 1995 as the Transatlantic Business Dialogue, recently renamed the Transatlantic Business Council, have pushed for “harmonization” of divergent standards, free passage of goods and authority to operate services under “mutual recognition” terms and elimination of what they call “trade irritants” and we consider some of our most important consumer and environmental safeguards. A transatlantic agreement that is little more than a vehicle to facilitate deregulation would not only threaten to weaken critical consumer and environmental safeguards, but also conflict with the democratic principle that those living with the results of regulatory standards – residents of our countries – must be able to set those standards through the democratic process, even when doing so results in divergent standards that businesses may find inconvenient. Thus, we are highly skeptical that an agreement focused on regulatory “harmonization” will serve consumer interests, workers’ rights, the environment, and other areas of public interest. Rather, it could lead to lower standards and regulatory ceilings instead of floors. A “free trade” deal must not limit the United States or the EU (or its member states) from adopting and enforcing standards that provide higher levels of consumer, worker, and environmental protection. We denounce the particularly opaque and exclusive nature of recent trade negotiations and insist that negotiating texts be released to the public. Given a prospective agreement would impact on a broad array of public interest policies, the process must be open to the public. 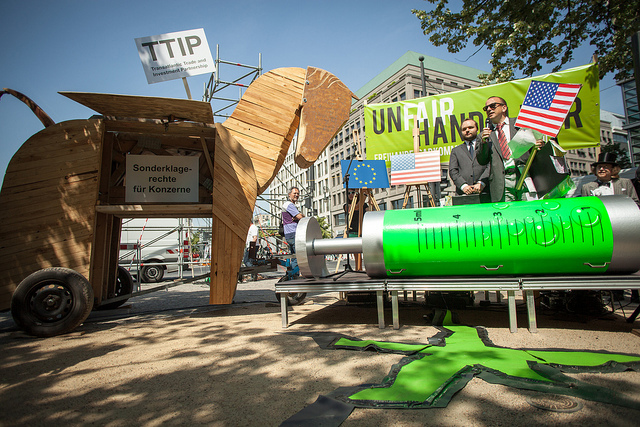 The U.S. and EU governments must commit to make negotiating texts and country submissions for TAFTA publicly available. Stakeholder groups, including those not granted the preferential access of official trade advisory committees, must be able to review the proposed text if they are to give meaningful input on the critical policy decisions at issue. Consultations with diverse stakeholders should occur early on and throughout the process. The disproportionate consultation with business and industry groups in prior agreements negotiated by the U.S. and EU has resulted in a narrow array of input and outcomes which has benefited industry over communities and the environment. No Investor-State Dispute Resolution: A potential agreement between the United States and EU must not include investor-state dispute resolution. Particularly given that U.S. and EU property rights laws and courts are robust, there is no pretext for granting foreign investors superior rights to domestic firms or subjecting our judicial systems to tribunals empowered to raid our Treasuries. The inclusion of such extreme provisions in prior trade and investment deals has enabled powerful interests, from tobacco companies to corporate polluters, to use investor-state dispute resolution to challenge and undermine consumer, public health and environmental protections. Investor-state tribunals have ordered taxpayers to compensate foreign corporations with billions of dollars for the domestic, non-discriminatory enforcement of such protections. To avoid such overreaching procedural and substantive investor privileges, greater than those afforded to domestic firms in either the United States or the EU, any deal must exclude investor-state dispute resolution. Safe Food: Trading partners must be free to establish facially non-discriminatory food safety, nutrition and labeling standards that are stronger than any harmonized norm set in an agreement and that meet the objective of consumer protection and environmental and ethical considerations. Each nation must be allowed to set such standards based on consumer demands and priorities alone, even in the face of scientific uncertainty. Food safety and inspection standards must be established at the highest level to ensure consumer protection, and should include plans for a transatlantic rapid alert notification system and a phase out of the non-therapeutic use of antibiotics in animals. Financial Stability: Any harmonized standards must set a floor of strong financial regulation, based on the most robust U.S. and EU reregulation efforts, to reflect the lessons of the deregulation-fueled financial crisis of 2007-2009, and must ensure the freedom of the trading partners to establish and enforce more robust regulations. The United States and EU must be free without exception to establish limits on the size of financial institutions; establish strong regulations on mergers and acquisitions; insist on separation of commercial banking, investment banking, and insurance functions; ban or restrict the offering of risky financial services or products; establish fees and taxes for financial institutions and financial transactions; adopt reserve requirements above international standards; impose performance standards and investment obligations; cap fees and interest rates, and enact capital controls. Access to Affordable Medicines and Innovation on the Internet: Consumers’ access to affordable medicines and their ability to innovate on and use the Internet must not be restricted. The United States and EU should ensure that consumers will maintain their ability to use the Internet freely and not be subjected to increased healthcare costs for the sake of pharmaceutical corporations’ narrow business interests. This prospective agreement should exclude all intellectual property provisions, including, among others, those relating to patents, copyright, trademarks and data protection. Climate Security: Any agreement must provide policy space for signatory countries to respond to the emerging climate crisis and facilitate a transition to more sustainable consumption and production patterns. To advance sustainability and avert catastrophic climate change, trading partners must have the policy space to adopt tax policies, mandatory performance standards, carbon and pollution regulations, schemes for self-generation or „feed-in“ electricity tariffs, procurement policy that gives preference to renewable energy and green products, renewable energy standards, or other policies without being subject to challenge under the agreement. Safe Drugs, Medical Devices, and Chemicals: Trading partners must be free to establish high safety and efficacy standards that drugs, devices, and chemicals must meet before being afforded market approval or market access. The United States and the EU must be free to institute the testing regimes they deem appropriate. Effective Regulation of Emerging Technologies: Trading partners must be afforded discretion to regulate products of emerging technologies, such as nano- and bio-technologies. Flexibility must be preserved to enact new facially non-discriminatory regulations to meet the objectives of consumer protection and environmental or ethical protections in the face of evolving technologies. Given the breadth of consumer, worker, and environmental implications of such an extensive potential agreement between the United States and the EU, this letter does not represent an exhaustive list of our concerns. We will be monitoring the negotiations closely and will defend our rights against behind-closed-door decision-making at the service of corporate interests. We will also continue our efforts to develop and promote alternative approaches to global challenges of climate change, environmental deterioration, unemployment, increasing inequality and food insecurity that are based on democratic accountability and cooperation instead of economic competition and “trade” liberalization.